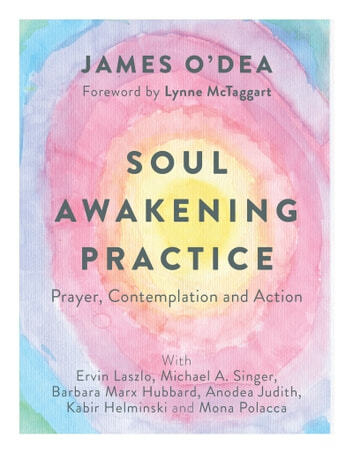 A mantra for a new consciousness with an introduction by Lynne McTaggart and contributions by Ervin László, Michael Singer, Barbara Marx Hubbard, Anodea Judith, Kabir Helminski and Mona Polacca. The Soul Awakening Practice is built around a 6-line mantra. A mantra is a sacred utterance. Repetition of a mantra aids in concentration and is believed to have both psychological and sacred powers. This is a book for activists, for ecologists, and for spiritual seekers engaged in the quest for a spiritually coherent and united worldview. The human race has a moral imperative to transform the way we live and The Soul Awakening Practice offers a way for us to engage spiritually. Integrating ancient wisdom, modern science and psychology this mantra prayer is a means by which to reveal a coherent worldview available to each and every one of us. Written by James O’Dea, the former president of the Institute of Noetic Sciences and member of the Evolutionary Leaders Group, the book not only includes the prayer itself but a commentary on the power of prayer as well as expanded, contemplative line-by-line reflections and explanations. To provide different viewpoints and perspectives on this new worldview, the book includes commentaries by key luminaries from science, cosmology, evolutionary theory, Yoga, Sufism and indigenous wisdom. Be receptive and allow the prayer to illuminate your insights. Experience your own unique journey of awakening.